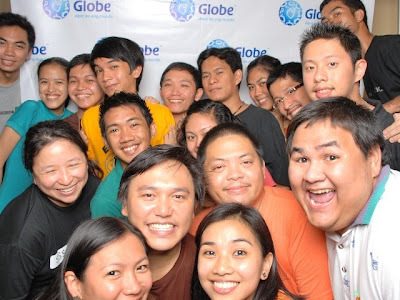 Last friday selected bloggers are invited by Universal McCann and Globe to attend an event that will launch there latest service. The Service is called EveryBodyTXT20. Basically the EveryBodyTXT20 enables GLOBE and TM Subscribers to enjoy more text messages for just a little amount of your money. With P20, you can have 200 text messages Globe to Globe/TM + P20 txt messages to other networks. Just go to any Globe Load Retailer / Sari-Sari Store / Business Center and ask for Globe Everybodytxt20. Just pay P20 and the retailer will send you your Globe Everybodytxt20 from their phone. Simply text ETXT20 to 8888 to register. P20 will be automatically deducted from your account upon registration. * For ETXT purchased as load, there is NO need to maintain the P1 minimum balance to continuously enjoy your EVERYBODYTXT service. Because of the campaign they formulated a promo they called Paramihan Challenges, where everyone is challenged to perform any paramihan stunt. In the event, the bloggers will get to try first the challenge. The bloggers are challenged to fit in a small and fragile kiddie pool. If they can pull the challenge, they will get a price of P1k each. As the countdown starts, the bloggers tried to squeez in the small kiddie pool. I'm also amazed that everyone is helping each other. Teaming up to fit in that small space. They grabbed each other's hands and tried their best to endure a minute to stay fit inside the kiddie pool. And after a struggling 1 minute, the bloggers got to fit 36 people inside the pool. Off course everybody rejoiced. Every one of them got a prize of P1000 cash. 2. Record a video performing a Paramihan Challenge of your choice. 3. Upload your entry as a Video Post on the Paramihan Challenge group on Multiply. a. Once on the Paramihan Challenge group page, click on the "Add Video" link. - Short write-up describing your Paramihan Challenge. After the event, everyone continued to party and do what every blogger likes the most during events. Having a Photo op. 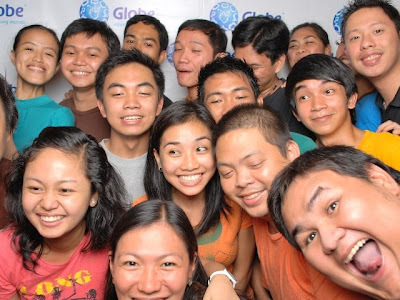 Everyone went home happy, thanks to Globe. sana, di ako nakasali sa paramihan, di na ako kasya. then do it tapos video mo then send as an entry malay mo manalo ka pa. see contest rules na lang above.